Two days after sending 64 satellites into orbit from Vandenberg Air Force Base, Hawthorne-based SpaceX launched a resupply mission to the International Space Station Wednesday from Cape Canaveral in Florida – with one glitch. 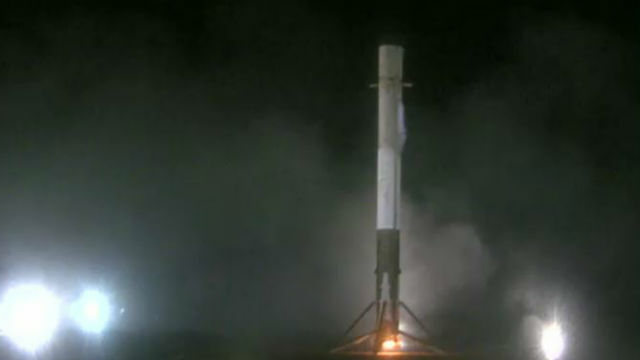 The SpaceX Dragon capsule was launched aboard a Falcon 9 rocket at 10:16 a.m. California time. The Dragon capsule, which previously traveled to the Space Station in February 2017, is loaded with nearly three tons of equipment, food, spare parts and scientific experiments. It is expected to arrive at the Space Station on Thursday. Although SpaceX has been re-using its Falcon 9 rockets to cut the costs of launches, the rocket used Wednesday had not previously flown. The company attempted to land the first stage of the rocket back at Cape Canaveral for re-use in future missions, but the rocket missed the target and landed at sea off the coast of Florida. The launch of the CRS-16 supply mission to the International Space Station had been scheduled for Tuesday but had to be postponed for a novel reason — moldy mouse food. According to NASA, one of the experiments being sent to the space station involves mice, but before Tuesday’s launch, “mold was found on food bars” for the rodent investigation. “Teams will use the extra day to replace the food bars,” NASA announced Tuesday. Other experiments included in the mission include an effort to measure and perform 3D mapping of Earth’s tropical and temperate forests; a test of a robotic technology to refuel spacecraft in space; and two student experiments inspired by the “Guardians of the Galaxy” films. Those experiments are the winners of a national contest organized by Marvel Entertainment and the U.S. National Laboratory that asked students to develop “microgravity experiment concepts that related to the Rocket and Groot characters” from the films. According to NASA, the Rocket experiment will test the reliability in space of a dental glue activated by ultraviolet light, while the Groot experiment will explore an alternative method for watering plants in a zero-gravity environment. The launch was the 20th of the year for SpaceX. SpaceX made history on Monday with its Vandenberg launch, using a Falcon 9 rocket that had flown two previous missions. It was the first time a rocket has been used for a third time. The company’s “Block 5” series of Falcon 9 rockets are designed to be used as many as 10 times.